Tent with aluminum foil. Let rest 5 – 7 minutes, then serve. Skirt steak is not the tenderest cut of meat, but it certainly is tasty when prepared the right way. There are two cuts, inside skirt and outside skirt. The inside is the better of the two therefore a little more expensive. Be careful not to confuse skirt steak with flank steak. They are distinctly different cuts of meat from different areas of the cow. Skirt comes from the plate while flank is cut nearer the animal’s rear quarter. To serve, either slice meat thin on the gross-grain or in larger portions but still cut on the cross-grain. Carefully cut away the silver streaks and connective tissue from the tenderloin. Combine all ingredients in a glass bowl or plastic bag. Marinade in the refrigerator for 2 – 6 hours. Discard marinade. Lay meat on a foil lined cookie sheet. Roast 20-20 minutes. Let meat rest 5-10 minutes under a foil tent. This allows the juices to remain in the meat when sliced. Carve into ½ inch thick slices and serve. 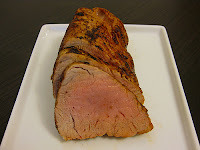 *Pork tenderloin packages usually contain 2 pieces of meat. If you only use one, the other freezes well for use at a future date. Wash potatoes under cool water. Pat dry. Poke several sets of holes in each potato with a fork. This stops the potato from bursting as it bakes. Rub potatoes with a small amount of olive oil to keep the skin soft. Wrap each potato in a section of foil, then lay on a cookie sheet. Bake for 50 minutes or until a toothpick inserted in the potato shows no resistance. Set the foiled potatoes on top of the stove while the tenderloin is roasting. They will remain toasty hot. 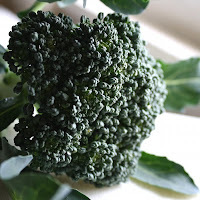 Trim off the broccoli stalk. Cut the flowerets into serving pieces. Pour olive oil in a medium-size frying pan. Heat on medium high. Stir in the broccoli and butter when the oil shimmers. Stir to coat the broccoli well. Sauté until crisp tender. Sprinkle Gorgonzola crumbles over the broccoli and serve. Vonnie Hughes is an author friend born and bred in New Zealand who now lives in Australia. We were talking about holidays in our respective countries and Vonnie shared info about Anzac Day. This is a national day of remembrance in both her countries originally commemorated on 25 April every year to honor the members of the Australian and New Zealand Army Corps (ANZAC) who fought at Gallipoli in the Ottoman Empire during WWI. It now more broadly commemorates all those who served and died in military operations for their countries. 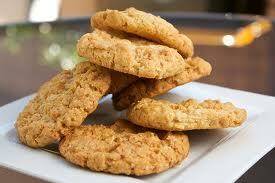 Vonnie told me about the Anzac Biscuit and that it has been claimed the biscuits were sent by wives to soldiers abroad because the ingredients do not spoil easily and the biscuits kept well during naval transportation. She also supplied the recipe which is terrific! Stir the bicarbonate of soda in 2 tbsp. of boiling water and add to the mixture. It will bubble. Another Regency Historical, Mr. Monfort’s Marriage, has businessman Matthew Monfort inveigled into marrying an earl’s daughter. With good reason he loathes the ton, so his new wife needn’t think she’s going to win him over, even though she’s quite delightful…and intelligent…and sweet…However Verity shows him that not all members of the ton are idle layabouts and that he can do much good with his largesse and with–shock, horror–the unexpected and embarrassing title conferred on him by Prinny. If you remember, I have a rough time cooking pork chops that aren’t tougher than the soles of my shoes. Marinated pork chops braised in white wine was my first successful attempt. Since pork chops are a favorite of Studs, the New Year seemed like a good time to devise a second recipe that was easy and tasty. Give it a try and please let me know what you think.